Cameron and Tyler Winklevoss, the twins best known for their part in the history of Facebook, filed a proposal with securities regulators on Monday that would allow any investor to trade bitcoins, just as if they were stocks. The plan involves an exchange-traded fund, which usually tracks a basket of stocks or a commodity, but in this case would hold only bitcoins. ... “There are so many ways it could go wrong,” said Ugo Egbunike, a senior specialist in exchange-traded funds at the data company Index Universe. Since early June, the PBOC has sought to force Chinese banks to redirect their lending away from shadow bankers—a mélange of trust companies, pawnbrokers, leasing companies and others—whose lending is putting further stress on an economy already slowing, economists say. To achieve this, the central bank withheld cash from the interbank market, essentially twisting the arms of traditional bankers to force them to change their lending practices. On June 20, China&apos;s leaders feared the credit squeeze was getting out of hand. Overnight interest rates at which banks borrow from each other spiked to as high as 30% that day. A rumor circulating in Shanghai that Bank of China had defaulted on an interbank payment was given more credence when a Chinese newspaper, the 21st Century Business Herald, reported the alleged default on its website around 6 p.m. According to the newspaper, Bank of China defaulted during that afternoon, "deferring transactions for half an hour due to a fund shortage." Around 8 p.m., Bank of China issued a denial, saying it hadn&apos;t defaulted and had completed all outbound payments "in a timely fashion" that day. U.S. banking regulators seeking to prevent another global financial meltdown are set to impose new minimums for capital amid predictions that smaller lenders will get easier terms. The Federal Reserve goes first today with a vote that could call for banks to maintain loss-absorbing capital equal to at least 7 percent of risk-weighted assets, in line with international standards agreed upon by the Basel Committee on Banking Supervision. Greece has three days to reassure Europe and the International Monetary Fund it can deliver on conditions attached to its international bailout in order to receive the next tranche of aid, four euro zone officials said on Tuesday. The lenders are unhappy with progress Greece has made towards reforming its public sector, a senior euro zone official involved in the negotiations said, while another said they might suspend an inspection visit they resumed on Monday. American women, who trail men when it comes to making money, leading companies and accumulating wealth, are closing the gap on at least one measure: cheating on their spouses. The percentage of wives having affairs rose almost 40 percent during the last two decades to 14.7 percent in 2010, while the number of men admitting to extramarital affairs held constant at 21 percent, according to the latest data from the National Opinion Research Center’s General Social Survey. Zynga has replaced founder Mark Pincus as chief executive, bringing in Xbox head Don Mattrick to try to pull off a turnround at the former star of social gaming. Mr Mattrick’s move robs Microsoft of its top video games executive at a key moment in its rivalry with Sony and Nintendo, as it prepares for the launch of its first new console in eight years. While remaining as chairman at Zynga, Mr Pincus’s yielding of the top executive job marks one of the most dramatic recent falls from grace in the consumer internet industry. OGX Petroleo & Gas Participacoes SA’s warning of a shutdown at its only producing crude oil wells is intensifying speculation that billionaire Eike Batista’s flagship company will have to restructure debt. OGX shares fell 29 percent in Sao Paulo yesterday, erasing about $300 million of market value, while its bonds due 2018 dropped to a record low 19 cents on the dollar. The Rio de Janeiro-based producer said in a regulatory filing that it’s considering halting output at the Tubarao Azul field after a technical review and scrapped three other offshore projects. Two top managers of the scandal-plagued Vatican bank resigned on Monday following the arrest of a high-ranking cleric with close ties to the financial institution, in the latest of a string of embarrassments for the Holy See. Director Paolo Cipriani and deputy-director Massimo Tulli stepped down three days after the Vatican was rocked by the arrest of Monsignor Nunzio Scarano, who is accused of plotting with two other people to smuggle 20 million euros into Italy from Switzerland. While we’re talking about titans and strategy, pick up “The Art of War” by Sun Tzu. Michael Ovitz, the former Creative Artists Agency agent turned investor, used to give away a copy of this book to his staff. Even if you find the underlying message repugnant, it is an interesting window into the soul and strategy of much of the corporate world. If you want an even deeper examination of modern management and strategy techniques, it is always worth reading the ultimate philosophical classic: “The Prince” by Niccolò Machiavelli. 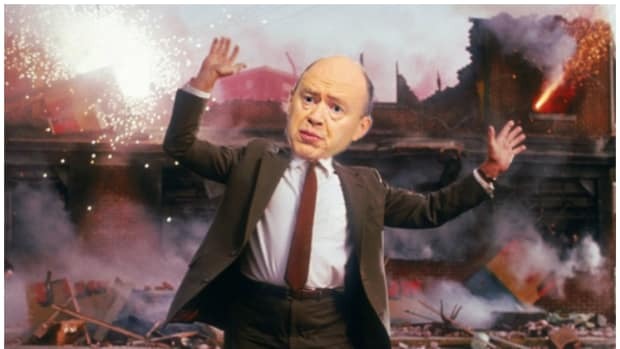 The sad, strange story of Deutsche Bank; banks are ditching the Fed; Cohn on taxes; millennials are (you guessed it!_ killing the very foundation of financial capitalism; sheep like Obama; and more.